It appears I celebrated too soon…back in April when OPM declared autism to be a medical condition and decided to allow its providers to offer ABA coverage on health insurance policies for federal employees, I was sure this would mean the major insurers would step up to offer this important benefit. It’s been shown not to break the bank, costing an average of 31 cents per month per insured—and that minimal cost is passed on to the consumer anyway, so why wouldn’t insurance companies offer it? But only 38 plans across 23 states will offer ABA coverage. Hawaii is not one of them. And as progressive as I’ve always thought California to be, only a portion of the state (primarily Southern California counties) will have insurance coverage through federal plans. In fact, in only 2 states (New Mexico and Arkansas) will coverage be state-wide. The other 21 states will only have coverage in various regions. So a lot of autistic kids will either not receive the treatment they need—and deserve, or their families will suffer a huge financial impact if they do access treatment. This inequity never fails to disgust and infuriate me. Autism is a medical condition. Families buy health insurance in case of medical emergencies. Autism is definitely a medical emergency. So what exactly is the issue? I honestly cannot understand why autism is not routinely covered. Do the people who say they “don’t want to pay for” my child’s autism through very modest insurance premium increases not realize they will pay much more in taxes for lifelong care? I would make the same argument to the legislators who tell us how they “care” about our kids, but then vote down legislation to require insurance coverage. Are they not aware of a study by a Harvard researcher that showed the cost of caring for an autistic person across the lifespan to be $3.2 million—with most of these expenses occurring in adulthood?2 The taxpayers are footing this bill. For the small businesses owners with more than 50 employees who fear they will go bankrupt if required to offer plans with autism coverage, I would ask you to look at the actual data that has been collected from the 32 states that have passed legislation. It will not break the bank and will allow you to attract and retain the best talent. And beyond the fiscal issue is the moral one—how can a wealthy country allow children who can be helped to lead productive, independent lives just languish while there are effective therapies available but for most, are out of reach? 2. Ganz, M. L. (2007). The Lifetime Distribution of the Incremental Societal Costs of Autism. Archive of Pediatric Adolescent Medicine. Vol. 161, No. 4, 343 – 349. 3. Helt, M., et al. (2008). Can Children With Autism Recover? If So, How? Neuropsychology Review (2008) Volume 18, 339 – 366. doi: 10.1007/s11065-008-9075-9. Unfortunately, when the greatest country in the world is morally sick, it will not help it's children. Our three grandchildren are autistic and not yet in their teens. Our daughter and son in law do their best with what they have. I often tell her, being wealthy has advantages. God bless and strengthen and guide you. Thank you for your comment, Gary. I am sorry to hear about your grandchildren. I hope your children are pressing their school system to provide legally-required services for your grandchildren. It is very unfair that we expect our schools to provide therapy for a medical condition, but people are all too willing to let the insurance companies of scot-free, unfortunately. I mean this is ridiculous that insurance companies do injustice with them.The image you have been used is really right.Give long life and happiness to Autism child. It really is...a huge injustice. 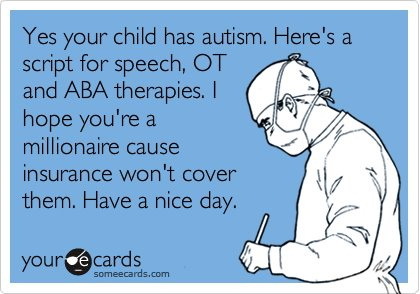 Because autism is the only cognitive disorder I know of where with proper therapy, a diagnosis can be lost. Legislators with weak spines say things like, "We really care about your children, we really, really do, but we don't believe in mandates." More like they don't want to upset the insurance companies. All sort of things have been mandated for insurance coverage, including kidney dialysis and diabetes treatment. Some health insurance companies will allow you to get maternity insurance plan after you are pregnant. While this may cost you an additional 20 to 40 % more it's possibly still worth the investment. Any interruption to your business can cause huge financial burden. You have to pay salaries to employees, taxes, bills and other business obligations from your pocket. You can cover this kind of financial losses by taking business interruption insurance.